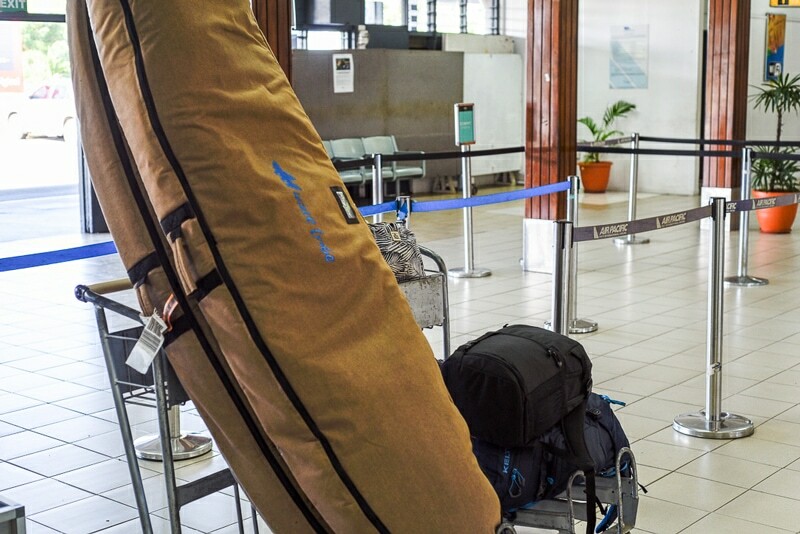 The bad news: board bag fees are hard to avoid when traveling with surfboards. The good news: we’ve researched and sorted through the board bag fees of over 35 airlines to help you keep as much money in your pocket as possible. In an effort to combat the most annoying part of surf travel planning, we’ve conveniently organized and color-coded airlines into three sections based on their board bag fees: Best, Tolerable, and Worst. This way, you can review the best and the worst airlines for surf travel and factor that into your surf trip equation before you book your flights. In the case of surfboard bag fees, it pays to do your research. Airlines are always randomly changing their policies, so in addition to reviewing this list, always be sure to call the airline and confirm their latest fees. One time we had confirmed reasonable board bag fees on an airline’s website, only to learn when we checked in that they supposedly had a fee change and hadn’t updated their website yet with their new #[email protected]&%*! astronomical fees. It was criminal (*cough* Fiji Airways). It’s also good to note that some airlines give you a discount if you pre-pay the baggage charge before you get to the airport. Hopefully, this guide will help you avoid overspending on surfboard bag fees so you can spend that money on better things for your surf trip, like a new surfboard. *NOTE: Most airlines’ sporting equipment guidelines are overly complicated, confusing, and downright terrible. We’ve included a link in the details section of each airline that will take you directly to their excess baggage details so you can read the small print. We always recommend you double-check the information below, and also call in and confirm with the airline directly. It’s also good to note that airlines frequently change policies. We’ll try to keep this list as updated as possible, but always check the website and call to confirm. For example, Virgin Atlantic used to have one of the best policies, and they recently changed their policy entirely for the worse. Bummer. 516-622-4222 Free / ~$100 Free and may count as checked baggage to and from North America if under 50 lbs and 9’0″. No charge if you’re in Business Class. One board per passenger. Normal excess baggage rates apply if you carry in excess to this maximum allowance. On Aer Lingus regional flights, the length allowance is only 6’5″. Additional details on Aer Lingus surfboard bag fees. 844-727-4588 Most flights will run about $18 if you book online Per bag one way. Your surfboard must be packed in a recognized surfboard bag and does not exceed 277 cm /109 inches ( about 9’2″) in length. Note: Kiteboards and bodyboards are classified as surfboards. Additional details on Air Asia surfboard bag fees. 800-777-3999 Free / Varies Emirates will accept sporting equipment as checked baggage and part of your standard baggage allowance. Baggage allowance is 2 pieces. Economy Maximum Dimensions are 62 linear inches/158 cm (length + width + height). Maximum Weight for Economy Class Passengers is 50 lb/23 kg. Additional details on Air Emirates surfboard bag fees. 877-824-4846 Free Air Tahiti Nui allows one free sports equipment item on its operated flights in addition to your normal free checked baggage. All depending on the cabin of travel, frequent flyer status, weight, and dimensions of luggage. Additional details on Air Tahiti Nui surfboard baggage fees. 800-262-1234 Free / ~$150 No charge if less than 6′ 5″ in length and less than 50 pounds. Can have multiple boards as long as bag stays within stated weight and dimension limits. Sporting items exceeding 6.5 feet but less than 8.2 feet in length may still be accepted but are subject to oversized item charges. Maximum weight restriction of 70 pounds per item. Overweight charges for US travel are about $150. More details on Air New Zealand surfboard bag fees. 800-252-7522 $25 Each way. Unless otherwise noted, all standard, overweight, and oversize fees apply. 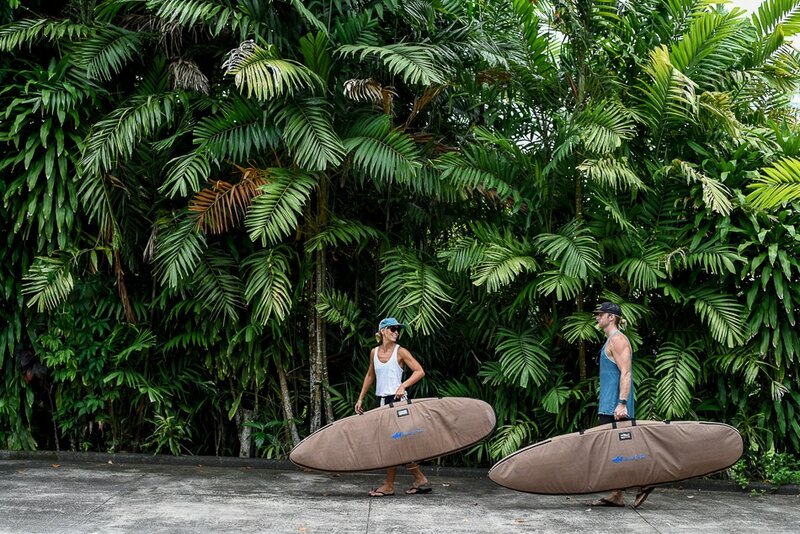 One surfboard bag is defined as one case with up to two boards inside. Flights on a 737 or Airbus aircraft the equipment may measure a maximum 115″ (9 ft., 7 in.) in length alone. For flights 2000-2999 and 3330-3499 the maximum combined dimensions may not exceed 115″ (linear inches = length + width + height).Additional details on Alaska Airlines surfboard bag fees. 800-222-4262 Free / $75-$150 Treated as a checked bag (first bag is free). Each checked bag must not exceed 62 inches (157.48 cm) in dimensions (length + breadth + height) & 50 pounds (22.73 kilos) in weight. Bags greater than 50 lbs (23 kilos) & 62 inches will run from $75-$150 depending on length and weight. Bags greater than 100 lbs are not accepted. Additional information on Bahamas Air surfboard bag fees. 800-247-9297 Free / $60 Accepts surfboards as checked baggage providing they do not exceed the maximum weight restrictions for checked baggage and are packed in a recognized bag or case to safeguard against damage. The bag containing the board can be up to a maximum size of 190cm x 75cm x 65cm (75in x 29.5in x 25.5in). Bags weighing more than 23kg (51lb) may incur a heavy bag charge of about $60. Additional details on British Airways surfboard bag fees. 866-285-9525 Free Included as part of your baggage allowance. You can have up to 3 separate bags of less than 25 kg each or a single bag up to 75 kg. Max weight total (for all luggage) per passenger is 75 kg or 165 lbs. Additional details on Interjet Mexico surfboard bag fees. 800-438-5000 Free / $75-$200 Included as checked baggage. Must be under 50 lbs and/or 9’0″ and you should not incur an oversize fee. If you’re over your bag limit, it’s $200 from the Americas (to Brazil from US is $75; to Brazil from Asia is $175). ***Exception (when traveling with domestic flights) : If the surfboard is over 158cm (62inch), an oversize fee will be incurred of $75-$200. Additional details on Korean Air surfboard bag fees. 866-435-9526 Free / $60-$195 Free, as part of your checked allowance. Cannot exceed 118 linear inches or 50 lbs. If beyond your baggage allowance, excess baggage fees depend on departure/destination and range from $60-$195. Additional details on LAN surfboard bag fees. 800-645-3880 Free / $70-$150 Included as part of your baggage allowance depending on service class. Must be less than 70 lbs and/or 6’5″. If you exceed your allowance, on continental flights it’s $70; intercontinental is $150. You need to register sports baggage at least 24 hours before the flight. Additional details on Lufthansa surfboard bag fees. 800-552-9264 Free / $15-$140 As part of your checked baggage allowance, and will be subject to excess baggage charges if overweight. One board per person. Max length is 8′. If it is in excess of your allowance, there is a zone-based weight system in which fees vary from $15-$140 per 6.5 lbs depending on location. Additional details on Malaysia Airlines surfboard bag fees. 800-227-4500 Free – $135 Free as part of your checked baggage. Must be in a bag and may not exceed 70 lbs and 9 ft. If it’s beyond your baggage allowance, excess fees apply depending on place of departure/destination. Between Australia and Americas is $135. Additional details on Qantas surfboard bag fees. + 44 871 246 0002 €50 online / €60 at the airport Large sports equipment (does not define any dimension restrictions on web). Fee charged per item per one way flight. Maximum weight of 20 kg. Additional details on RyanAir surfboard bag fees. 800-742-3333 Free / $150-$225 As part of your checked bag allowance. After that, additional baggage is either $150 or $225 depending on destination. Only one board per person. Any item above 32 kg (70 lbs) will not be accepted as checked baggage and may have to be re-packed or sent as cargo. each item should not exceed 200cm x 75cm x 80cm in dimension. Excess baggage charges apply if the dimensions of your baggage exceed the dimensions of your baggage allowance. 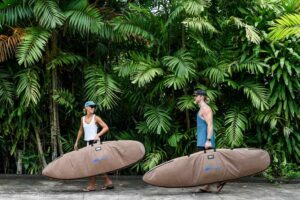 Additional details on Singapore Air surfboard bag fees. 800-722-9675 Free / Varies Only one board and it must not exceed 7’2” (200 cm) and 50 lbs. Larger boards must go as cargo. If larger than 200 cm, the bag is to be accepted strictly as cargo, relevant cargo rates will apply. Additional details on South African Airways surfboard bag fees. 800-237-6639 $75-$150 One-way within Mexico $75 USD. International flight $150. Fee is per case; up to 3 boards per case. Max length on a narrow-body cabin is 6’6″. Max length on a wide-body cabin is 9’5″. Max wight is 100 lbs. Additional detail on Aero Mexico surfboard bag fees. 888-247-2262 $50+ Surfboards are subject to a $50 CAD/USD handling fee (plus applicable taxes). The fee is charged for one-way flights and for each way of travel on round-trip and multi-segment flights. board counts as one piece of baggage towards the maximum number checked baggage for your fare type. Overweight and oversize fees do not apply as long as items are within the acceptable maximum limits of 32kg (70lbs) and 158cm (62in). Boards are accepted as checked baggage on a space available basis only so call ahead. Additional details on Air Canada surfboard bag fees. 800-237-2747 $55-$150 Each way. Surfboards great than 3’5″ and less than 6’5″ in dimensions will now be charged as a “specialty” item, the same charges as applicable for surfboards greater than 6’5″ will apply. Customers will no longer be able to check-in surfboards as part of their ticketed baggage allowance. Board less than 3’5″ in dimensions can continue to be checked in as a “normal” bag i.e. part of the ticketed baggage allowance. Additional details on Air France surfboard bag fees. 800-284-2622 $50-$125 You can check the first bag (paying the respective fee) as part of your baggage and take a maximum of three boards in one bag per passenger with a maximum weight of 32 kg (70 lbs.) and up to 3.7 meters (12 feet) long. Do yourself a favor and check out all of the rules, restriction and details before booking your flight. Additional details on Avianca surfboard bag fees. +44330 3655454 $45-$60 Under 45 lbs is $45 when booking online or $55 at the airport. Up to 70 lbs is $50 online or $60 at the airport. Per item, per flight. If it’s over 70 lbs, there will be additional charges. Additional details on EasyJet sports equipment policies and a separate page showing their fees and charges. 800-367-5320 $35-$150 Fees are one-way, per bag. As many boards as you want per bag. Max height 9’5″ (for travel within Hawaii board can be 10’9″) and max weight of 50 lbs. $35 per way between Hawaiian islands, $100 per way between North America and Hawaii, $150 per way for most international flights. For flights between the USA and Australia/New Zealand, boards will be included in the free baggage allowance when travel is non-stop, direct and/or connecting service. Just be prepared to pull Hawaiian Airlines surfboard bag fees up on your smartphone in case they give you any grief. 800-538-2583 $50 Per board each way, domestic and international. One surfboard per case; size and weight restrictions do not apply. Items weighing more than 100 pounds will not be accepted as checked baggage. No surfboards allowed on flights to/from Bermuda, Haiti, Peru, Port of Spain, Santo Domingo and Santiago. Additional details on Jet Blue surfboard bag fees. 800-435-9792 $75 Part of checked baggage. Each way, per bag. Fins must be removed. Additional details on Southwest Airlines surfboard bag fees. 800-221-7370 $50-150 Each way. Up to 6’5″ will run about $50 for Domestic flights, Europe, Morocco, and Algeria; $100 for International. If the board is over 6’5″ it’ll be $100 for Domestic flights, Europe, Morocco, and Algeria or $150 for International. Must be under 70 lbs. When you get to the airport, go to the check-in desk to fill out a Declaration of Transport form. Without this document or with inadequately packed equipment, TAP may refuse your surfboards. Additional details on Tap Portugal surfboard bag fees. 800-433-7300 $150 You’ll be charged $150. Multiple boards per bag is okay as long as bag is less than 70 lbs. If the board bag is less than 62 inches and 50lbs., you’ll be charged the applicable checked bag fee based on the number of bags you check. For Brazil only: Maximum surfboard length of 108 in., not included in checked bag allowances. First surfboard charge is $42.50; additional surfboards are $85.00. Additional details on American Airlines surfboard bag fees. 800-233-2742 $150+ Based on measurements and fees increase based on the thickness of your bag. Can cost you four times the oversize bag fee of $150. Adding up to potentially $600 or more each way. They may ask for your first born child too. Not a surfer friendly airline. Additional details on Cathy Pacific surfboard bag fees. 800-359-2672 $150 As of Aug 2018, large sports equipment will be transported on international and domestic flights for a fee of USD150.00, regardless of whether it is part of the passenger’s luggage allowance. These items will not be subject to overweight or oversize luggage fees. The maximum weight allowed is 100 pounds (45 kilograms), and the maximum size allowed is 115 linear inches (294 linear centimeters). Additional details on Copa’s special baggage allowance can be found here. 800-221-1212 $100-$200 Two boards allowed per bag. Over 70 lbs come with an excess bag fee. Surfboards over 9′ 5″ are not allowed. $150 for travel to most all regions. $100 to and from Brazil. Additional details on Delta Airlines surfboard bag fees. 800-772-4642 $150 Each way, one board per bag. No longer than 8’2″. Must give advance notice and call in the request 24 hours before flight. Different charges, taxes or fees may apply, depending on the laws of each country. Additional details on Iberia surfboard bag fees. 800-428-4322 $150 Merged with American Airlines. Additional details on American Airlines surfboard bag fees. 800-525-3663 $200 Per bag, two boards allowed. Call ahead . Domestic flights run $50. If flying to Asia, Guam and Oceania from Japan it’s $100. For Asia, India and Oceania to and from Hawaii, North/Central/South America, Europe, Middle East and Africa it’s $200. Additional details on Japan Airlines surfboard bag fees. 800-426-5204 $150 Thai Airways might take the cake now for having one of the most complicated and convoluted surfboard bag fee descriptions. One of our readers told us as of March 2018, they’re charging $150 USD per board! Ouch. The painful details are here on Thai Airways. 800-864-8331 $150-$200 $150 each way between the U.S., Canada, Puerto Rico and the U.S. Virgin Islands, and $200 each way for all other travel. Max of 99.p lbs. & 9’5″. Multiple boards allowed, remove fins and pad well. Additional details on United Airlines surfboard bag fees. 800-862-8621 Does not accept bags over 190cm (6’3″) in length! Free to bring your surfboard bag as part of your baggage allowance, but there are recent major changes to size restrictions. The baggage allowance only applies if your surfboards don’t exceed 23 kg (50 lbs) in weight and 190 cm (about 6’2”) in length. Additional details on Virgin Atlantic surfboard bag fees. What are your go-to airlines for surf travel? Please comment below with your personal experiences or tips on your favorite airlines for surf trips! If you are heading to Southeast Asia, fly Singapore Airlines. No board fees and very good service. Get to your flight a couple of hours ahead of schedule. Awesome Paul, thanks for your feedback! Just called Copa about a trip coming up on August 16th. Apparently they updated their sports equipment policy on August 1st and now charge $150/each way for surfboards limited to 2/bag. Thanks for the heads up, Marcus! We really appreciate you letting us know. We updated the article and moved them down to the tolerable section. Hope you have an epic trip wherever you’re going! Copa air is free now. Took them twice this year and never was charged. They also give you a free beer or wine :). China Air charged me $150 per bag the first time and $150 per board the return :(. Anyone know about Xiamen air? Need to fly them to Indo soon but their website is confusing. Thanks for sharing these insights, Dawson! Very good to know about Copa hooking you up with free board bag transfers and China Air sticking it to ya. I don’t know anything about Xiamen Air, but please keep us posted if you’re able to figure out their surfboard bag fee details. Thanks again! Hey Paul, thanks for the heads up on Thai Airways. I just tried to check out their surfboard bag policy to confirm and it is such nonsense. I just can’t believe why so many airlines make it so damn complicated. Anyway, I updated their policy details in the post for the benefit of other readers and demoted them to the Worst Surfboard Bag Fees List. Thanks again. Qantas Check-in will attach a Fragile tag to the bag and you must complete and sign the limited release portion of the baggage tag. Singapore Air rocks! I took 3 boards from LAX to Jakarta and no fees! Compared to EVA air the previous year from LAX to Bali, and they tried to charge me $300 each way because my boardbag was 1 inch too long (and they used a tape measure to verify length!). That’s awesome! Thanks for the recommendation. It’s always great to get first-hand feedback on airlines because they change their policies so frequently. Hooray for Singapore Air! Thanks for posting this. There is nothing worse than booking your flight for a surf trip and not looking into surfboard bag fees before hand. I am saving this page to my bookmarks. Awesome, Clarence. We’ll do our best to keep it current for everyone. And we always suggest double checking with the airlines directly to ensure nothing has changed and to avoid any inconvenience or unpleasant surprises. Cheers!